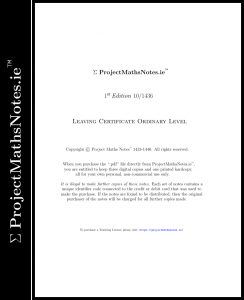 Comprehensive Revision-Notes for Leaving Certificate Higher & Ordinary Level Project Maths. Sequence of compelling fun exercises and worked examples help you cover all topics effectively. Download to your smart device – with the option to print out your copy on A4 paper at home. Do-It-Yourself learning technique. Same benefit as a full course of grinds – at a fraction of the cost. Inspired by feedback from over 200 students – Instant delivery, by download and by email. By purchasing, you agree to Terms & Conditions and No-Refunds policy. Product is for LEAVING CERT HIGHER LEVEL. By purchasing, you agree to Terms & Conditions and No-Refunds policy. Product is for LEAVING CERT ORDINARY LEVEL. Copyright © Project Maths Notes™ 1433-40 | “ProjectMathsNotes.ie™”, “Project Maths Notes™” and Sigma Logo “Σ™” are trademarks of M. I. 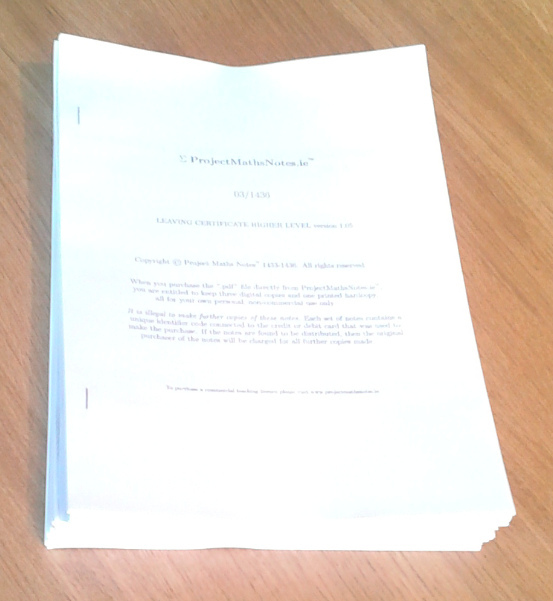 Publishing, Ireland.